Joel Duhon is a recording and touring drummer that has worked with some of the most successful (not to mention multi - platinum) and talented music producers in the world. He has performed with major label acts signed to Mercury Records and CBS / Sony to name a few while touring the world’s largest venues in the United States and Europe headlining and supporting other major label acts. 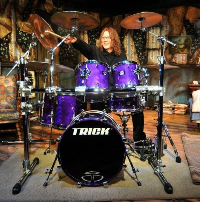 Joel is an Endorsing Artist for "Trick Drums USA" representing the cutting edge drum company worldwide.